Looking for winter style baseball cap? You can keep your head and ears warm in our Winter Wool Baseball Cap. 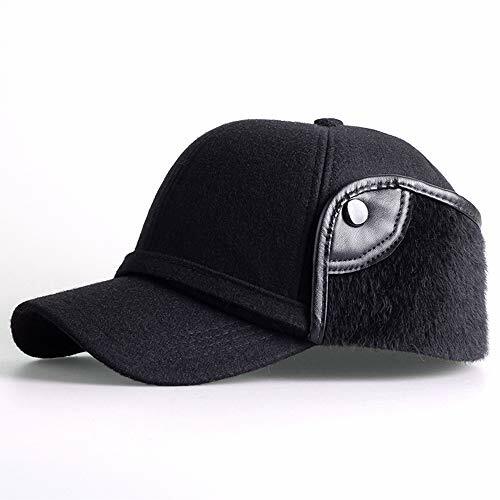 This durable quality cap sports unique style in featuring earflaps that are faux fur lined for added comfort and warmth. Featuring snap buttons on both sides, you can place this earflap above your ears or down for extra coverage as you wish. This Fleece Earflap cap with earflaps is also made with thick, soft, warm and water repellent material. For your convenience, four different sizes are available for the hat. Get this awesome ball cap with earflaps for your next winter outdoor activities. FITTED SIZE: Fit for 22.4"-23.2", 7 1/8- 7 3/8, 57-59CM. Crown measures 4 inches deep with satin lining. Earflaps measure 2 - 4 inches long with snap, faux fur lined. Thick, soft and warm material. Wind proof and water repellent. Available in gray, dark grey and black. Hand wash with cool water. Fabric:42%wool/58%polyester; Lining:100%polyester; Fur:100%polyester.Hand wash with cool water. FITTED SIZE: Fit for 22.4"-23.2", 7 1/8- 7 3/8, 57-59CM. Suitable for winter/autumn, great for outdoor activities.When you doing exercise like Cycling, Skiing, Camping, Hiking or Morning Workout,or any other outdoor sports.Stiff long visor will keep the sun and snow out of your eyes. EARFLAP DESIGN:This wool winter hat blends the baseball cap with the ear warmer. When it's not too cold, you can flip the earlobe or fold the beat into the warm ears and neck, which can block the cold wind. SNAP BUTTON DESIGN：the faux fur earflap is designed with buttons, which can be folded and fastened when no ear muff is needed. It is not only functional but also fashion. If you have any questions about this product by YOYEAH, contact us by completing and submitting the form below. If you are looking for a specif part number, please include it with your message.